I teach hatha yoga at Foster Wellness, which is located in the Magnolia neighborhood of Seattle, next to Discovery Park. Hatha yoga is a physical practice of poses focusing on breath and movement, woven into a philosophy that is thousands of years old. Through my studies with various teachers, I have developed a style that incorporates Western anatomy, movement and Eastern philosophy into a safe but challenging alignment-based practice. I work with each of my clients to tailor practices in order to suit his or her individual needs. I am a 500 hour level teacher with the Yoga Alliance and an Anusara Certified instructor. In 2015 I completed a two year continuing education program through Garden Street Yoga in Idaho to enhance my understanding of the practice and in 2017 became a Certified Yoga Therapist with the International Association of Yoga Therapists (IAYT). Yoga can be as simple as using the practice to refine the alignment in a particular pose and as complex as a way to connect with the world around us. I will develop practices for your sessions which address your specific needs and will refine the plan with you as your needs evolve. Yoga is an intrinsic part of maintaining one’s physical, mental and emotional health. As such, I support my own health through a daily yoga practice. I will work with you to do develop your own regular practice and I will act as a resource in this regard outside of our regularly scheduled sessions. I continue to explore the philosophical aspects of my physical practice and am regularly amazed at how applicable so much of what I experience on the mat translates into the rest of my daily experience. I have found that hatha yoga, along with a dedicated meditation practice, presents an opportunity to work through emotional and mental complexities which otherwise would have taken much more time to resolve. I teach yoga at Foster Wellness in the Magnolia neighborhood of Seattle (click here for directions). The sessions last from 60 to 90 minutes and are done privately by appointment (i.e., myself and one or two students). Following the session, I can provide an outline of the poses we covered so you can integrate them into your home practice. You are welcome to schedule a single class to re-boot your existing practice or visit multiple times during the week to receive consistent and steady support of your yoga life. ​Please refer to the fees page for rate information. Cancellation policy: If you are unable to keep your appointment, please notify me as soon as possible via email or phone, both of which are available 24 hours a day. Changes made to your scheduled appointment less than 24 hours in advance may incur a cancellation fee of $50. 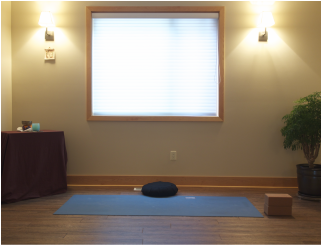 In-home private yoga sessions are possible depending on location, availability, and facility accommodations. There may be an additional traveling fee, depending on your location. Please call or email me for more information. Gift certificates for yoga sessions are available. Please contact me for details. Patricia Berger (www.bluelotussanctuary.com): one of my first teachers, she continues to shape my practice and philosophy to this day. She opened my eyes to the understanding that “the real world” isn’t something separate from yoga and meditation, but is an intrinsic part of it. Yoga is not just asana on the mat; the principles of the practice permeate everything we do. Mimi Kuo, Robyn Wexler, and Matthew Cohen (www.yogayard.com): through studying with them in Beijing, China I came to understand what it means to “play at the edge” of one’s physical capacity as well as how to teach with intelligence and compassion. They also taught me that Hatha yoga and other Asian physical arts, such as qigong, have a natural synergy and can play off one another within the same practice. Donna Farhi (www.donnafarhi.co.nz): through her books, seminars and workshops she has taught me that it is possible – and sometimes preferable – to explore yoga asana independently of everything but the cues from one's own senses. To create a pose out of what feels appropriate in one’s body is as important as following a teacher’s instruction. Denise Benitez, Rainey (www.seattleyogaarts.com) and Karen Sprute-Francovich (www.gardenstreetyoga.net): Former and currently Certified Anusara teachers in Seattle and Idaho, respectively, who continue to provide structure to my deep dive into the history of yoga, its philosophy, and its modern manifestation. Jen Harbour,who also teaches at Garden Street Yoga, is an Anusara Inspired teacher and is currently assisting me down the winding, challenging road of Adho Mukha Vrksasana (handstand).